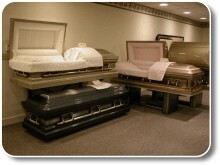 Most services involve the selection of funeral merchandise. 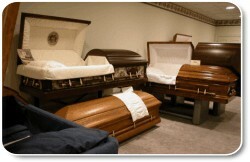 Rozelle Johnson Funeral Service professionals are knowledgeable in helping you understand that wide number of options available to you and they are trained to assure that the choices made are yours alone. 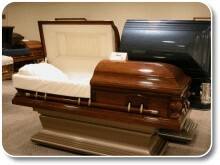 Caskets are made from hardwoods, carbon steel, stainless steel, copper and bronze— all in a wide selection and range of prices. A burial vault is an outer container that protects the casket from the elements while helping prevent the settlement of the earth above it. Vaults are made of concrete or metal. Metal vaults are made of standard and stainless steels, copper and bronze. Concrete vaults are available with a number of lining and reinforcing materials. A wide variety of types and prices are available. most area cemeteries require the use of an outer container. 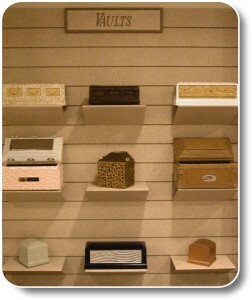 A variety of keepsake items are available to remember your loved one in a unique and thoughtful way. Choose from flag cases, jewelry, photo mementos, personalized boxes and more.